12:15 pm “Rock Step”: The Rock Step is a foundational element in Swing Dancing. Understanding how every action has an equal and opposite reaction (Newton’s 3rd Law) will help you redirect momentum with minimum force. 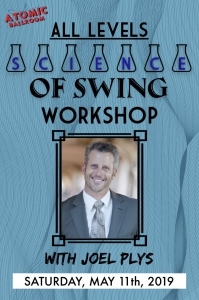 1:00 pm The NEWTONIAN Swingout (F=ma): Learn to apply the laws of physics to the most important figure in Swing Dancing, the Lindy Swingout! We will also discuss the common lead/follow habits that break these laws. 2:30 pm Cool Moves (L=I*w): Let’s reinforce what Newton told us in 1686 with a special emphasis on ROTATIONAL MOTION. In rotation, it is not how much matter (mass) you have but where it is relative to the rotational axis – WHAT?!? Don’t worry…we’ll explain that & how it works. The whole workshop is $50 or 5 punches from your Punch Card if you pre-register by 5/10/19. Or $60 at the door. Register in person or online now!